Making an organizational shift to focus on design is hard. Making that shift while acquiring other companies, and their unique approaches to design, doesn't make things any easier. Availity, a leading provider of information services for managing health insurance data, found themselves at just such a crossroads. 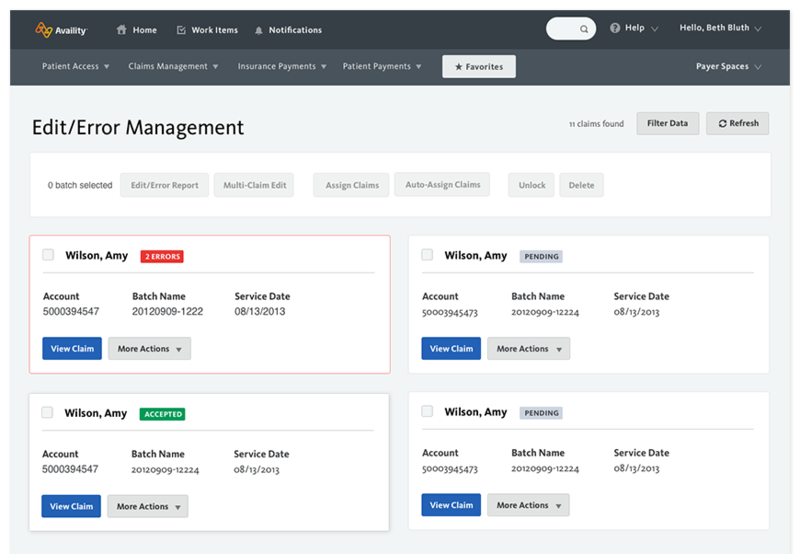 Recognizing the need to both prioritize design within their organization and to improve the customer experience for the many medical providers and insurance companies who use their suite of applications, Availity brought on Fuzzy Math to help define a path forward. We were tasked with creating solutions that Availity’s growing design team could use to ensure current and future applications were usable, and consistent with the rest of their enterprise offerings. Beyond their internal teams, Availity wanted to expand their products to provide a platform for 3rd-party development, necessitating a scalable design system that could be extended by outside teams. As an external design team, part of our task was to help align the two core Availity product teams, who to that point had operated independently rather than as a singular enterprise team. We needed to get everyone speaking the same language, and viewing their product not as an isolated experience, but as part of a larger enterprise ecosystem. Through workshops with their team, interviews with stakeholders, and reviews of their existing customer research, we quickly realized that the users across their core products truly weren’t so different, and in fact many people were users of more than one of Availity’s applications. We worked with their teams to build enterprise-level personas and journey maps, capturing the experiences of their users beyond just a single touchpoint in a way that could easily be shared throughout their organization. Through workshops, we asked each of their teams to draw out what they saw as unique in their products. By overlaying each product’s set of unique features on top of the other products, we were able to show just how similar each product truly was. Their team was onboard, and excited about the idea of shifting their products to a consistent platform and enterprise experience. 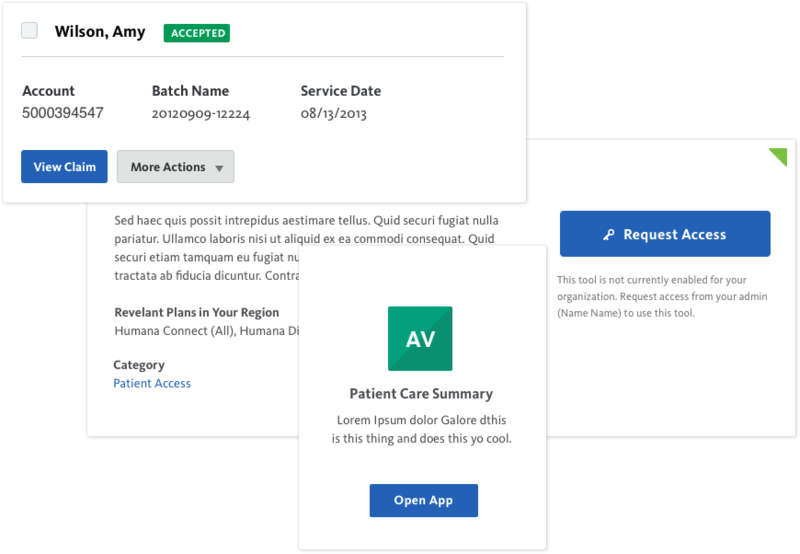 To construct a robust, usable enterprise design system we first pored through the current Availity applications, taking note of every interaction pattern, visual style, and content piece that was there today. We identified all the pieces that needed to exist across all enterprise applications, as well as some of the key features that would be unique to specific applications, but still feel like part of the same family. Through discussions with their team, we learned not only how things were, but why they were that way, ensuring our suggestions would follow past successes, and avoid any known pitfalls. While Availity gave us strong brand standards, those standards hadn’t yet been adapted to support interactive properties and platforms. We combined our knowledge of their existing applications with the visual language and goals of their brand standards to extend their existing communication design standards to complex interactive tools. To effectively capture and communicate these standards to their team, we developed a living style guide with clear definitions of the colors, typography, and graphic design to use across their entire enterprise product spectrum. From the patterns and content pieces we identified, we designed a single, ideal representation of the pattern which followed the newly defined Availity digital style guide. We compiled all of these pieces into a comprehensive pattern library, which provided not only ready-to-use components for all of their enterprise applications, but also help and guidance for their internal teams in implementing the patterns, and example pages showcasing the patterns in action. 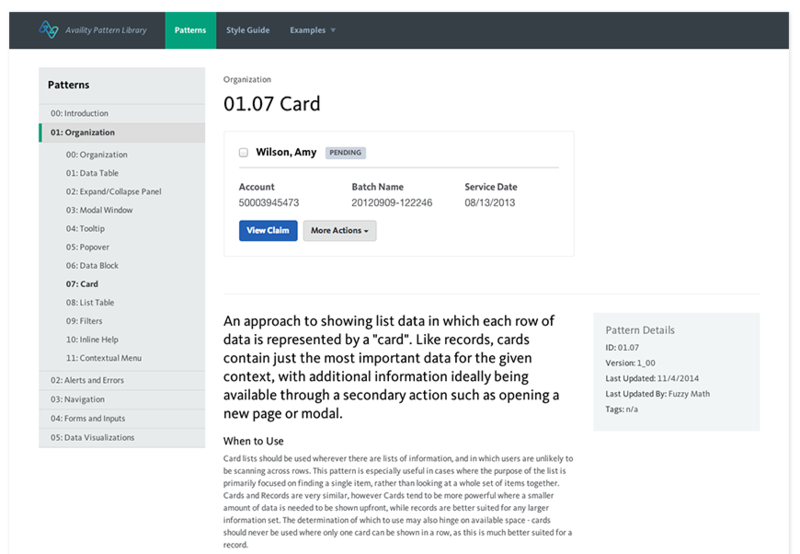 We designed the Pattern Library to be a great starting point, which would be updated and expanded by their team over time. To help ensure the longevity and success of the Pattern Library throughout the organization, we helped Availity define processes by which the Library would be updated and maintained for use both by their team, and by 3rd party developers who would be building on top of their applications in the future. While in the past we heard that many design decisions fell on individual developers, resulting in inconsistency, we helped Availity’s growing design team apply a scalable process that would scale into the future and allow a small number of people to tackle large designs. By using the pattern library, and an approval and update process driven by the design team, their developers would not only save time but also ensure their work resulted in usable, consistent interactions. To further help ensure the ongoing success of design within the organization, we reviewed the Pattern Library not only with their design and development teams, but also with team members from other departments, ensuring that everyone was onboard and ready to move forward. We believe that design is an important consideration throughout an entire enterprise organization. With Availity, we provided education to many non-design team members on ways they can deepen their knowledge of the people who use their products, and the roles they play in the successful design of a product. Working with executives and managers, we helped define a UX roadmap to pave the way toward ongoing design growth and maturity. Finally, we ensured that our Pattern Library and Style Guides were living documents, so that as their design system evolves their working references can follow suit. We'd love to speak with you about your project and how our user experience services can help.